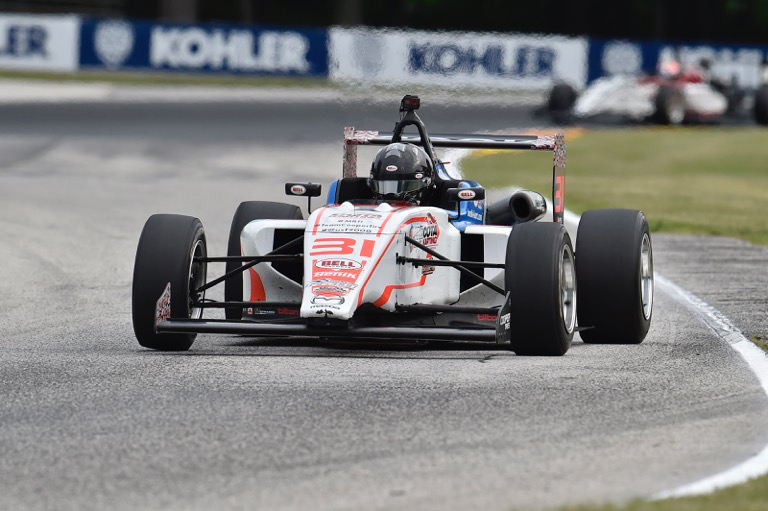 Competing at the iconic Road America facility in Elkhart Lake, Wisconsin, Team BENIK driver Sabré Cook had a challenging weekend in the Dairy State. Racing in rounds six and seven of the Cooper Tires USF2000 Championship Powered by Mazda, Cook closed the gap to the leaders but was involved in a pair of incidents, hindering any chance of solid results. Starting race six from P23, Cook quickly advanced forward seven positions to move into the sixteenth position in the opening laps. Looking to continue her march forward, a slight off put her behind the competition as the yellow flag would fly. Bunching the field back together for the restart, Cook was able to make quick work of a few competitors before a single car incident took her out of the race. Back on track Sunday morning, Cook started race two from outside row eleven but her race was short lived. Contact in the opening corner with a fellow competitor forced her to retire. Sabré Cook would like to thank her marketing partners for their continued support. A huge thanks to COTA Karting, MESA Fitness, Bell Racing USA, Apple Motorsports, Aspen Equity Group, and Grand Junction Motor Speedway.